The High holidays are a time for reflection and counting the blessing in our lives. One of the greatest blessings of all is the gift of friendship. I am thrilled to introduce my dear friend, Alexis O’Neill. Alexis is a gifted writer. 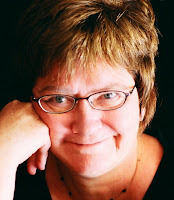 Her books strike a deep chord with children, teachers, and parents. Even more, Alexis is a great friend to the children’s writing community. Through her work with the Society of Children’s Book Writers and Illustrators (SCBWI) she has encouraged and mentored countless writers. 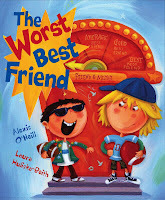 In her newly launched book, THE WORST BEST FRIEND (Scholastic), Alexis explores the challenges of friendship. With her gift of rhythm and word play, young readers will relate to Conrad as he deals with his worst best friend. It is an honor for me to introduce Alexis on my blog, and a greater honor to call her my friend. Tell me about Worst Best Friend. In THE WORST BEST FRIEND, Mike and Conrad are best, best friends – until a cool new kid comes between them. But what happens when teams are chosen for the big kickball game, and Conrad doesn’t measure up in the cool guy’s eyes? I think a lot about friendship. One day I wondered, how do some friends manage to stay friends their whole life long and while others break apart? And I wondered, when something comes between friends, can a friendship can ever be repaired? My dad, Tip, and his best friend, John, who were loyal friends from childhood, were the inspiration for this book. They called each other every week. When my dad was dying, John visited him every day. I also thought about how my sister, Donna, and our neighbor Corrine, have been best friends since they were babies, and now their own babies are grown up. I love that they all stayed true-blue their whole lives through. Was WBF written as a companion book for Recess Queen? I didn’t plan THE WORST BEST FRIEND as a companion book — but the illustrator, Laura Huliska-Beith saw it that way. She’s brilliant! She put the action right on the same playground as THE RECESS QUEEN, and even had characters make cameo appearances. It was a “duh” moment for me. Of course there are lots of overlapping stories on any school playground. I don’t know why it didn’t dawn on me! Kids who see the connections between the two books are ecstatic. It’s like a “Where’s Waldo” experience as they look for Mean Jean (who is now reformed), Katie Sue and the Cowboy Dude. Worst Best Friend and Recess Queen show a deep empathy for playground social dynamics. Where do you draw this knowledge? What is the most interesting question you have been asked by a young reader? One time, a second grader from an inner city school asked, “Have you ever lost confidence in something you were working on?” I was flabbergasted. No adult – never mind a kid – had ever asked such a deep question. Confidence is at the heart of all of art making – actually, of any kind of moving-forward-in-the-world activity — whether it’s writing, drawing, singing, acting, researching, exploring, living . . . So, that’s the question that stays with me. And when I find I’m not moving forward with a project, I wonder if it’s because I’ve lost confidence in my ability to do justice to it, or if it’s just a bump in the road to getting where I need to go. This entry was posted in Alexis O'Neill, Scholastic Books, Worst Best Friend by admin. Bookmark the permalink.